The doors of hell opened when Donald Trump was elected President of the United States. It was a day of infamy. A shot-in-the-arm to ethnic cleansing in America, and a blow to equality. A day for the wealthy to celebrate. There's enough angry white nationalists/bigots and racists being appointed to government positions right now to entirely undermine the Constitution in the next four years. You know what? We had it coming! For the last eight years the alt-right movement existed on the fringes of society where bigotry and racism were allowed to grow like a deadly virus. Those angry white men watched in horror and loathing as a black man ran "their country." The Neo-Confederate movement resurfaced with a vengeance. And they voted. I'll give you a hint; half of America sat on their asses and didn't vote! That cracked the door to hell wide open! When the Democratic National Party nominated Hillary Clinton - with her excessive baggage - instead of Bernie Sanders - the outcome was inevitable. Combine those three deciding factors and it's apparent why Trump was elected. 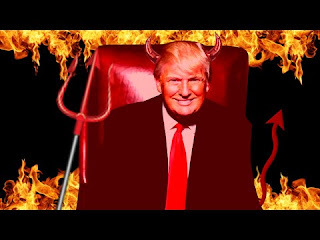 Now we get to deal with Satan's greedy orange son on earth for the next four years. Unless he's kicked out of office before then. The whole country is going to pay a price. Maybe it will be enough to reverse things the next time around. Until then, let's hope Trump doesn't completely dismantle our Constitution.